Clever design and the goes-with-anything benefit of her beautiful black color make this Miche Black Hip Bag a must-have for every Miche lover. She’s an ideal companion for every season and every occasion. 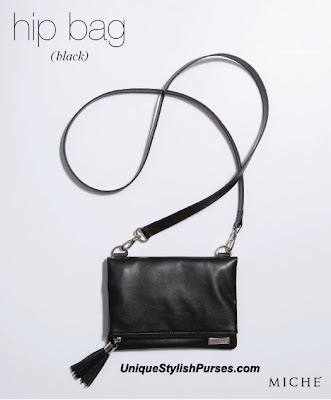 The Hip Bag (black) has a fold-over design with two zippered compartments—one for smaller items, and a larger one for your wallet and other essentials that features an additional zippered pocket. The bag is completely self-contained—it is not interchangeable like our traditional bags. Long Strap (included) allows for both cross-body and over-the-shoulder toting. Dimensions: 5.75” tall x 8” long; Strap is .75” wide and 54” long, with a 27” drop.